I'm on the hunt for some fab parent bloggers with children (and bumps) of all ages to work with on some exciting campaigns that I have coming up after CyberMummy. If you'd like to be considered please leave your details below (even if you think I already have them as my list is getting a total re vamp) and I'll be in touch soon. A national newspaper is looking to speak to someone tonight, for a feature in tomorrow's paper about IVF. If you've been through IVF and are free for a quick phone interview tonight can you please leave a comment with a means of contact? A couple of weeks ago I became Queen of Q in the Innocent Alphabet Challenge. The challenge pulled together 26 bloggers, each one King or Queen of their appointed letter. There were some brilliant posts and I pulled all of the pictures to create the ultimate Innocent Alphabet Gallery. Then I got thinking that I could turn this into a cool half term project for the kids. They love the idea and are already busy planning their ultimate alphabet. So stay tuned. A very big thank you to the following bloggers for kindly allowing their addition to be included here. Maison Cupcake, Babyrambles, Muddling Along Mummy, Being a mummy, A Mothers Ramblings, frugal Family, English Mum, In the Madhouse, me the man and the baby, Red Ted Art, Cooking Cakes and children, My Kids time, Mummy's Busy World, Yummy Mummy Flabby Tummy, Bringing Up Charlie, Is there a Plan B, Babbling Mummy, Glowstars, Cafe bebe, suburban Mummy UK, Whimsical Wife, Simply Hayley, More Than Just a Mother, Nonstop Mama, Are we nearly there yet mummy. I've had a day off (of sorts) today, perhaps more of a bus man's holiday if I'm totally honest but today I wasn't the businesswoman, the blogger or even the mother. Today I was free from responsibility and free to step back and enjoy Yan's new collection through the eyes of the many press and stylists that passed through Fashion Press Week. His was a unique offering amongst the thirty or so brands gathered at the stunning Grade 1 listed no1 Marylebone and he chose to create a new piece of the collection right there for all to see. 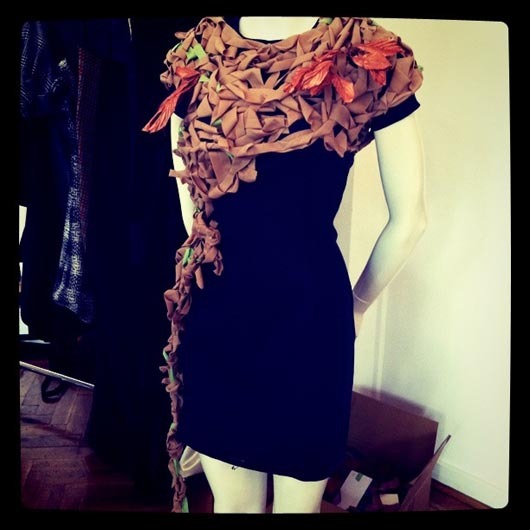 It's a beautiful dress - I love it. Simple yet amazingly intricate and made even more perfect by the fact that I instantly 'got' his inspiration. If you are interested , we have an aggressive Ivy type plant that's slowly enveloping the victorian fruit trees in our garden. It flourishes as the colour and life drain from these beautiful old trees. 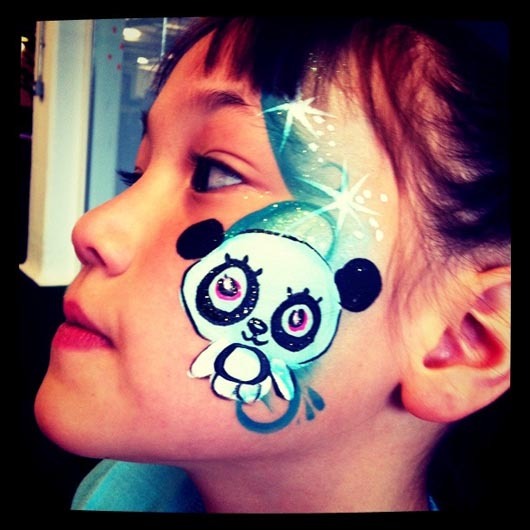 Visit more Silent Sunday's using the linky on MochaBeanieMummy's blog. Are you looking for a CyberMummy11 ticket? With CyberMummy only five weeks away I'm getting an increasing number of emails from people desperate to get their hands on a ticket. As you know, the conference is sold out but people's circumstances change and there are people with tickets who now can't make it. I am helping to match sellers with buyers but I think it would help all parties if there was a central place to find the info. 'Looking to buy' along with a means of contact and if you are selling, 'Looking to sell'. Once sale has happened the seller will then need to email me (sian at CyberMummy dot com) and I'll reply with the delegate transfer form. - Added 17/5/11. Please only post tickets that are being sold at face value. I DO NOT advocate the selling on of tickets for profit. Added 18/5/11. I also have details of a couple of hotel room that people are trying to sell on. 1 double room for Friday 24th June at the Hoxton and one double room for Saturday 25th at the Hoxton. Email me for more info. I've always been a satchel lover and until it was lost in a house move ten years ago I still regularly used the satchel that my god mother bought me to celebrate my first day at junior school back in 1978. It was aged perfectly and personalised inside with my name and address written in my own naive script. I loved that bag and I've been looking to replace it for years but nothing ever quite hit the mark. 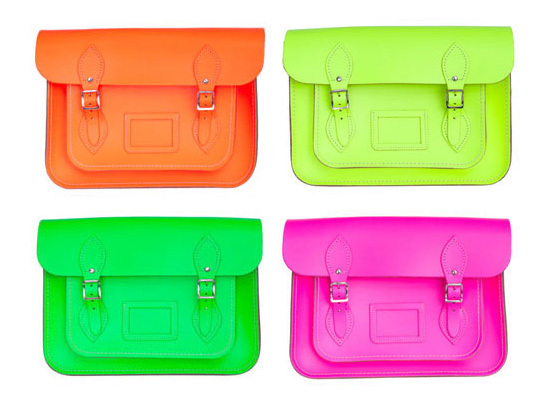 Then I came across these new fluo delights from the Cambridge Satchel Company and I'm in satchel heaven again. I went for the fluro green 14" so that my macbook fits perfectly inside and I'm one happy bunny! Satchels are going to be the bag of the season - mark my words! 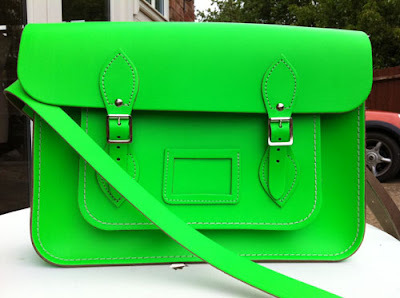 Fluro satchel from Cambridge Satchel Company. Available in four colours and four sizes, just to make it difficult to choose. It's Saturday afternoon and I'm in a country pub garden surrounded by lots of women and a few hundred dresses. The occasion is the culmination of a year long project by a beautiful young lady that I met through blogging who has since become my friend. She's bi polar and despite the tough journey that she's been on since being diagnosed she took on a mammoth challenge of wearing a different dress a day every day for 365 days to raise money for the mental health charity MIND. Dresses were bought, swapped, donated, worn then packed away awaiting today's big sale. Of course she catalogued the journey on her blog. Of course I had to make a purchase, this fab stripey Top Shop number, a bargain at £10. Everyone who knows her is so proud of what she's achieved, raising a grand total of £785. I used to work with Green Baby way back, they were my second clients when I left the rat race to be my own boss nearly eleven years ago. In that time I've watched them flourish and I can hand on heart say that one of the few products that I have continued to recommend to any new mum is their Organic Easy Change Sleep Gown. It is quite simply the best thing in the world for night-time nappy changes. No fiddly poppers on sleepsuits to mess around with and after a bit of practice you can even manage a nappy change without waking your baby. I digress... I'm not supposed to be talking baby gear because the big news is that they have their beautiful bright, funky organic clothing range is now available in sizes up to 8 years. The Green Kids collection has some really cool pieces, my favourite being this Striped Jumpsuit, as modelled by the lovely FunnyGirl. Please excuse the poor photography but it was getting late when she got in from tea at her friends last night and she insisted that she had to put it on straight away! And this evening when she came home from school - straight on it went. So it looks like it's a hit with her too. 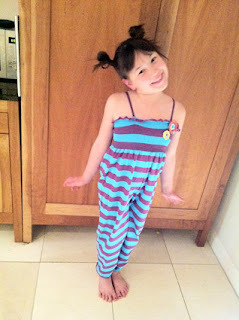 The jumpsuit is £22 from Green Kids at Green Baby. 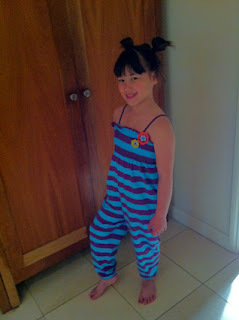 A very big thank you to Green Baby for sending us the jumpsuit, I will post an update to this review after a couple of washes - if I can get her to take it off that is! CyberMummy - Only 7 Weeks Away! 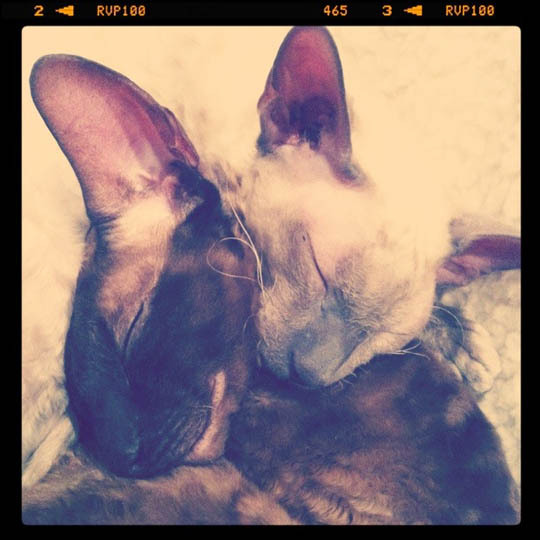 Every time I see my blog my heart takes a little leap as I see the days to CyberMummy11 counting down. 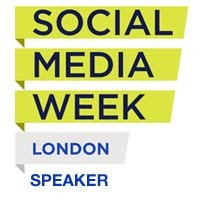 We have a great line up, some brilliant sponsors and we are honoured that Sarah Brown will be delivering the keynote. The chatter on Twitter is great fun to watch and I'm loving all the 'What are you wearing to CyberMummy?' tweets. There's been talk of fancy dress, big hats, moustaches, maxi dresses and bacon but rest assured it's a casual day - just wear whatever makes you comfortable. If you aren't already adorning your blog with a CyberMummy badge, get one now using the code in the sidebar so that you can start making new friends before the big day. So, what are you wearing? I could do with some inspiration myself! If you're not sure how to add the badge, tweet me @mummytips or pop me an email and I'll give you a hand. See you in.... 50 days! I've been threatening to make this since we went along to the pre screening of Annabel Karmel's new kids cookery show, Annabel's Kitchen. I have to admit that I was more than just a little bit scared by the prospect but after throwing the challenge down during Annabel's Save The Children #borntoparty on Twitter last week, I really had to stop flapping and get on with it. It all got a bit messy - but the girls really did have a great time making him and I had a great time watching them. And here he is in all his glory.... Mr Pig! What do you think? As soon as we had finished I texted a pic to Annabel - who replied saying she thought he was 'Piggy Perfection'. I will die a happy mother. If you fancy joining the challenge you can find the Watermelon Pig instructions online or in Annabel's new book, Annabel's Kitchen My First Cookbook. 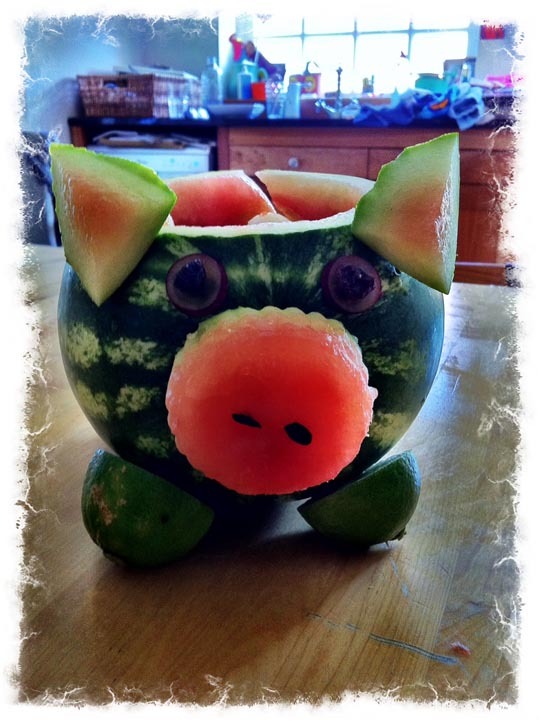 Christine Mosler took up the challenge and here's her little pig. If you have one you'd like to share please leave a link in the comments and I'll add it to the post. 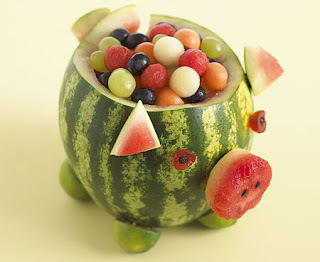 You can find the full piggy watermelon recipe on Annabel's website. For this week's Silent Sunday.